Russie D'Europe avec la partie la plus peuplee de celle D'Asie. 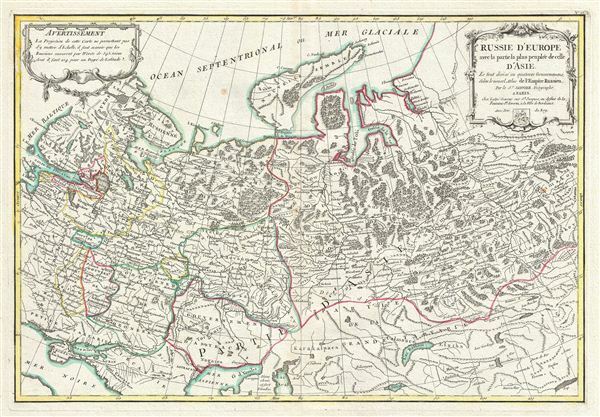 A beautiful 1783 example of Jean Janvier's curious decorative map of Western Russia. The map covers from Poland and the Baltic Sea eastward as far as Ilimskoy, Siberia, and extends southwards to the Black Sea and north as far as Nouvelle Zembla and the Arctic. Ostensibly Janvier's map focuses on the most inhabited portions of the Russian empire in europe and Asia. If offers excellent detail throughout showing mountains, rivers, forests, national boundaries, regional boundaries, forts, and cities. Russia at this time was dominated by Catherine II, the Great. Catherine was born a German princess but inherited the Tsardom after murdering her husband, Peter III. Catherine was an ambitious ruler who nonetheless patronized the arts, science and learning. She contributed to the resurgence of the Russian nobility that began after the death of Peter the Great. Catherine promulgated Charter to the Gentry reaffirming rights and freedoms of the Russian nobility, and abolishing mandatory state service. She expand Russian rule into Poland and was instrumental in two of Poland's three major partitions. She was less well loved by Russia's countless serfs, who she reduced practically to the level of chattel slaves and whose revolt she crushed in 1773. This particularly harsh treatment of the peasant class eventually lead to widespread discontent that would eventually culminate, long after Catherine's death, in the bloody Bolshevik Revolution. A large baroque title appears in the upper right quadrant. Drawn by Jan Janvier around 1883 for issue as plate no. 22 in Jean Lattre's 1783 final issue of the Atlas Moderne.